AMD's Radeon HD4770 is a bargain bucket powerhouse, but is it the best? Whenever someone asks for a graphics card recommendation, it feels instinctive to point them at something in the £150 region. We're constantly being astounded by the amount of power offered at this price. The 216-core GeForce GTX 260, for example, which currently resides in one PCF PC, has yet to struggle with any game running at full res on a 30-inch monitor, yet you can pick one up for just £140. Why bother spending more and why risk spending less? The pre-launch hype around AMD's latest Radeon GPU, the HD4770, was all about trying to convince us that you could go lower and still get the full gaming experience. You'd be forgiven for interpreting some of the headlines ('The killer $100 card!' being a typical example) as meaning you need never break two £50 notes again. 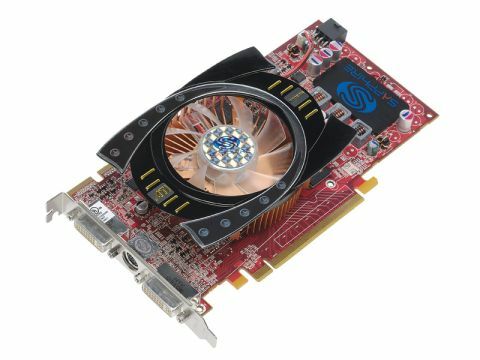 Needless to say, we began testing our ﬁrst HD4770 – from Sapphire – with a somewhat sceptical mindset. The spec sheet for the RV740 chip (around which the H4770 is based) does look quite impressive. It will go down in history as the ﬁrst 40nm graphics processor, which, at 826 million transistors, makes it an engineering feat on a par with Intel's 45nm Penryn CPUs – and it has a lot of pixel-pushing potential. For example, it makes the most of this next stage of transistor miniaturisation. Core clockspeeds are a good 30 per cent up on AMD's previous £80 GPU, the HD4830, at 750MHz. This means that the RV740 runs 125MHz faster than an HD4850, but unlike that raging furnace of a card, the HD4770 never gets particularly hot to the touch. The chip temperature peaked at around 65˚C during our tests, but most of the time it barely exceeded the 40˚C mark. To keep up with this, AMD has kitted out its own card with the quad-pumped GDDR5 RAM that we last saw strutting its funky stuff on its highest end HD4870 and HD4890s. The effective speed of this is 3.2GHz, or, to use the technical term, lots and bloody lots. The chip architecture is slightly different to that of the outgoing HD4830, but because it features the same number of uniﬁed shaders (640) as well as texture mapping units (32) and ROPS (16), it's almost certain to outperform that particular chip. The important question is whether the clockspeed increases are enough to put it in the same league as the HD4850. The most signiﬁcant blot on this card's copybook, then, is that it's limited to just 128bit memory bandwidth. And that's the very visible blemish that stopped us instantly falling for it upon ﬁrst sight of its spec sheet. For all the theoretical power of the core – which by some measures is very close to the HD4850 – we've never seen a GPU with 128bit memory that can cope convincingly with higher resolutions and any amount of anti-aliasing or image quality settings. Even with the double-double speed advantage of the GDDR5, though, the HD4770 is slightly starved of memory bandwidth compared to even the HD4830, let alone the HD4850 or its 256bit Nvidia competitors. The maximum throughput on the HD4770, for example, is just 51.2GB/s, compared to 63.5GB/s on the HD4850. The HD4770 puts in a fair shot at overcoming this. For our review, we were particularly interested in its performance at the 1680x1050 resolution of a 22-inch monitor. We didn't expect it to perform well at higher resolutions and sub-£100 cards have been doing well at lower levels for a while now. Here, however, the gap between it and the HD4850 begins to show – especially as the image quality settings are cranked up. Which is more or less what we were expecting to ﬁnd. The key point is that, so long as you can live without anti-aliasing, there's no game that's playable on an HD4850 that you won't be able to get away with on an HD4770. Factoring in the low power consumption and tiny size of the HD4770 makes it look more attractive again – especially as an upgrade to a 'family' PC – and it bodes well for the next generation of similarly priced cards. As promising as that sounds, things aren't as clear-cut as the dramatic sub-$100 saviour headlines would have you believe. Perhaps the weakness of the pound at the moment and the retailers struggling to clear out their old stock have combined to create perfect buying conditions for older GPUs, but we've recently seen HD4850s available for roughly the same amount of cash as these new cards. And if you're willing to spend just £50 more for a GeForce GTX260 or HD4870, you'll see an enormous leap in performance that more than justiﬁes the extra expense. As much as we appreciate what AMD has achieved by launching a card this good at this price, right now we can only recommend it as a second choice.